We possess a deep understanding of coding and auditing for all specialties and healthcare institutions. PRN Advisors possesses one of the largest pools of certified coders in the country most of whom are in the U.S.
PRN’s National Coding Advisors (PNCA) is comprised of nationally renowned coding and audit experts who lead and audit all our engagements. As a PNCA they are held to rigorous standards including educational requirements encompassing teaching, speaking engagements and publishing. Does your organization need a coder? If so, click here. 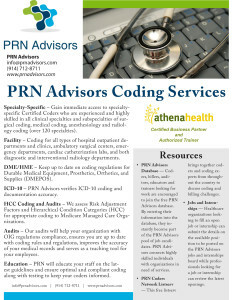 Specialty Specific – PRN Advisors gives you immediate access to specialty-specific Certified Coders who are experienced and highly skilled in all clinical specialties and subspecialties of surgical coding, medical coding, anesthesiology, and radiology coding (over 120 specialties). Facility Coding – PRN provides coding for all types of hospital outpatient departments and clinics, ambulatory surgical centers, emergency departments, cardiac catheterization labs, and both diagnostic-and-interventional radiology departments. DME/HME Coding – PRN keeps up to date on coding regulations for Durable Medical Equipment, Prosthetics, Orthotics, and Supplies (DMEPOS). ICD-10 Coding – PRN Advisors will verify ICD-10 coding & documentation accuracy. HCC Coding and Audits – PRN can assess Risk Adjustment Factors (RAF) and Hierarchical Condition Categories (HCC) for appropriate coding to Medicare Managed Care Organizations (MCOs). Audits – PRN audits will help your organization with OIG regulations compliance, keeping you from paying fines; identifies if you are leaving money on the table; ensures you are up to date with coding rules and regulations; improves the accuracy of your medical records and serves as a teaching tool for your employees. Education – PRN will educate your staff on the latest guidelines and ensure optimal and compliant coding along with testing to keep your coders informed. PRN has its own team of compliance advisors who provide a third layer of expertise to ensure coding compliance and legal protection. Each Coding & Auditing Team has their own PRN National Coding Advisor (PNCA) who oversees and audits each assignment and reports back to the client. With one of the largest databases of Certified Coders we make sure the right team is selected for your project. PRN’s National Coding Advisors must meet our rigorous standards that include requirements to provide teaching, speaking engagements and publish annually. Advisors collaborate and utilize PRN Advisors’ infrastructure and resources to lead coding and auditing engagements nationally. Collecting the “Who’s Who” of Coding and Auditing is a mark of excellence that sets us apart. PRN’s mission is to provide highly specialized coding and auditing services to healthcare clients with a strong commitment to high quality, client service, ethical standards, and professionalism.